Hey Friends! I hope y'all had a Happy Halloween. It was by far the most fun and special one yet for us. This was the first year that Madeline seemed to understand what you do on Halloween. She had a blast trick-or-treating! She rehearsed that you ring the doorbell, what you say when they open and say "thank you very much" after they give you candy. Sure enough, she did it at every door we stopped at and it just about melted my heart! It was such a fun night, and I already can't wait to do it again next year. 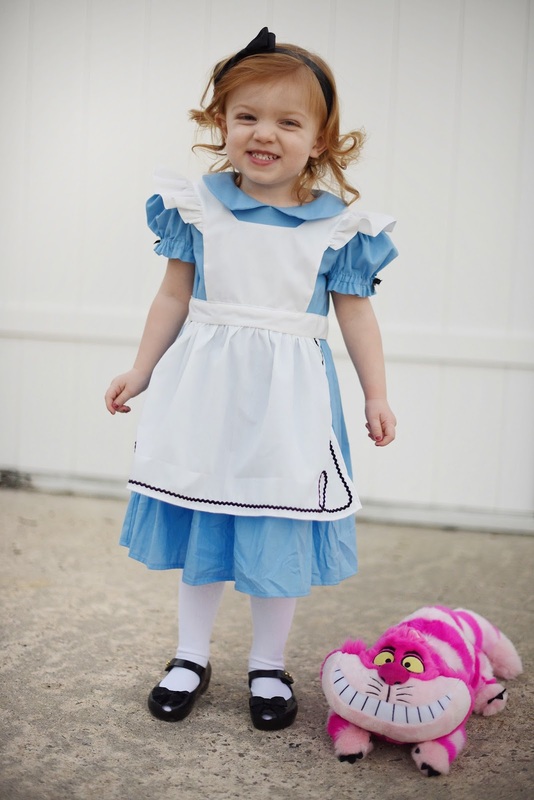 Madeline's costume is actually the second one I ordered. The first one was a complete nightmare with the seller not following through. I thankfully got my money back, then found this dress and could not be more pleased! It's so sweet! When I saw it on her for the first time, I just about cried. She loved it so much, and it was exactly what I had imagined for her. 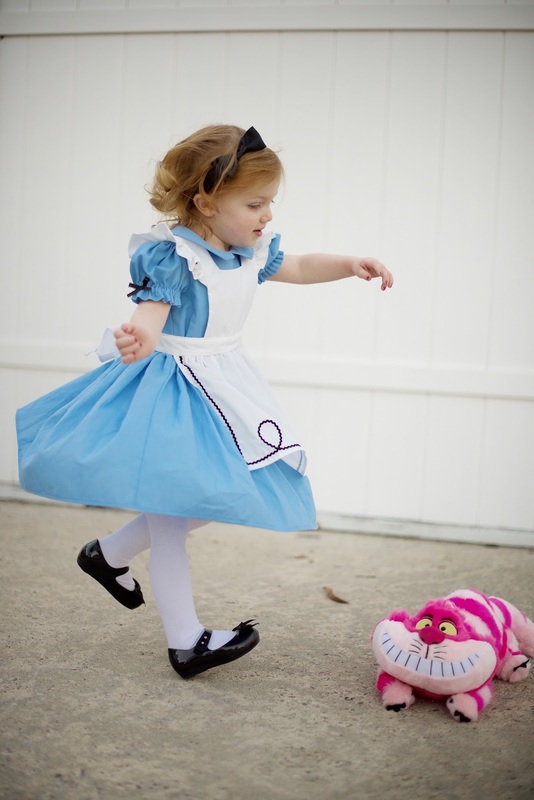 Of course she had to have a Cheshire Cat as well. 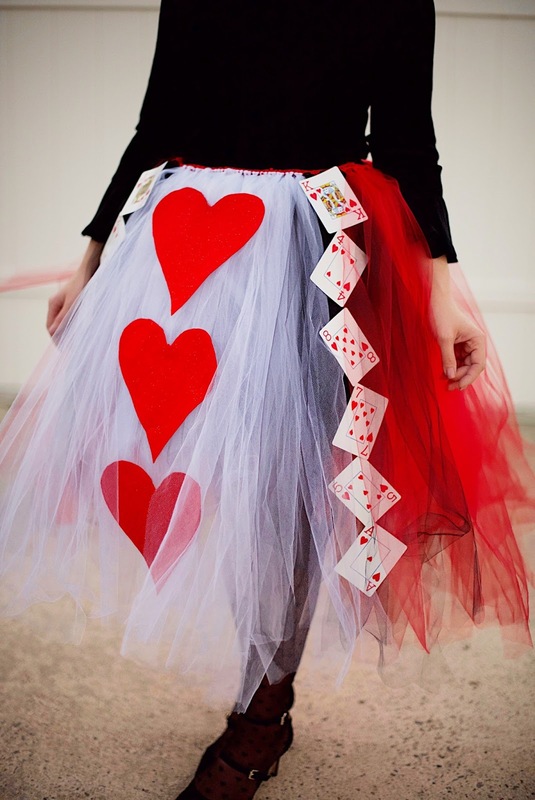 For my costume, I had seen ideas of a Queen of Hearts skirt and felt I could pretty easily make one myself. Have y'all ever seen (or made) a tulle table skirt? If so, you may know how I put this skirt together haha. I started with some of this ribbon for the waistband. Then I tied the tulle through the holes of the waistband, creating two layers of tulle. If you've ever made anything with rolls of tulle, then you know that it does not go very far! I definitely had to use it conservatively, but two roles of black tulle, four of white tulle and six of red tulle ended up being enough. I then printed out a large heart on a piece of cardstock, cut the heart out and traced it on three sheets of this glittery felt. I used this glue to stick it on the skirt. The deck of cards was actually a last minute touch. My brother so kindly gave me his deck of cards, and I used the same glue to attach them to the skirt. I love the way it turned out! All together, this skirt ended up costing me about $20. The weight of the tulle ended up being too heavy to keep the skirt up on its own, so I used safety pin to pin it to the black pencil skirt I wore underneath it. The crown I purchased separately on Etsy. 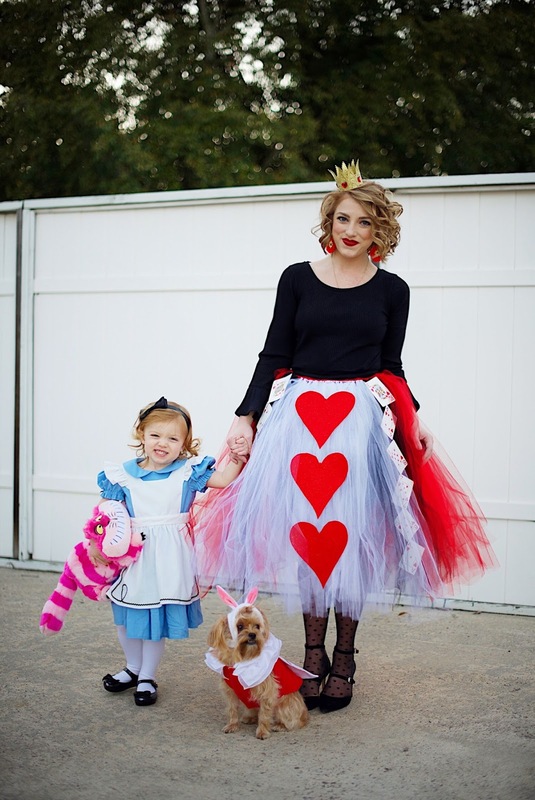 And there you have it...a DIY Queen of Hearts costume! I hope y'all loved our costumes as much as I did. I had so much fun planning them and putting them together. We actually won first place in a costume contest this past weekend. 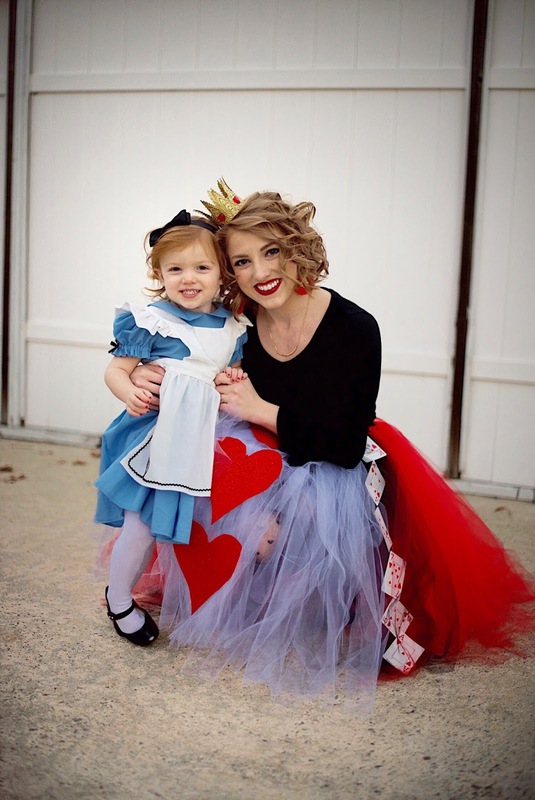 After seeing Madeline and Jaycee in their costumes, Alice in Wonderland will always have a special place in my heart. I'll end this with one of my all-time favorite quotes from Alice in Wonderland. Thanks for stopping by! 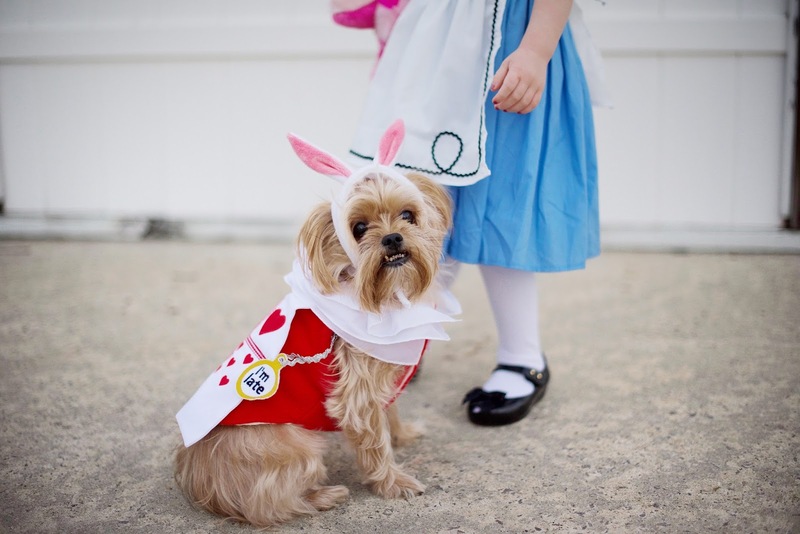 If you dressed up for Halloween, I'd love to hear all about it! Let me know in the comments below. 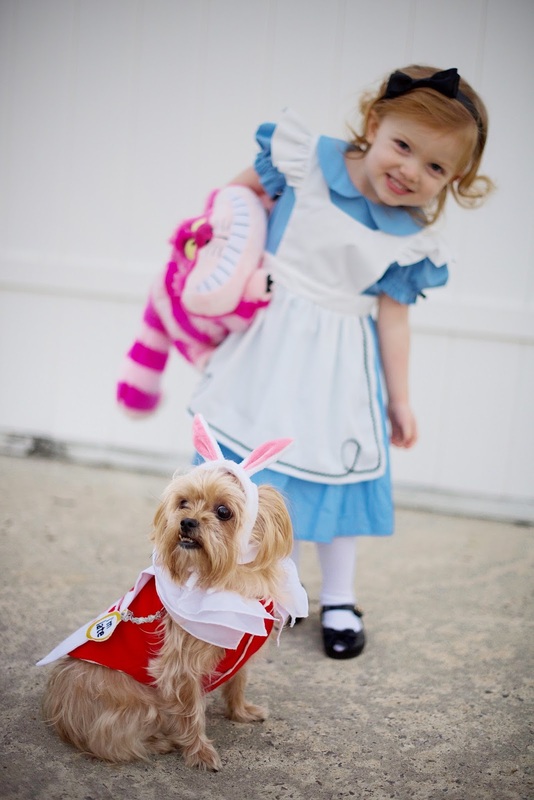 This is seriously the cutest costume trio I've ever seen! I love how dedicated you are as a mama, Rachel! You always do such a great job with Madeline!